Perhaps power is the flame wooing some “evangelical” moths. They can’t help themselves – even when the flame is a bona fide proto-fascist liar, wife dumper, misogynist, strip-club owner, narcissistic megalomaniac, and Muslim and Mexican hater. First, notice who is not named. 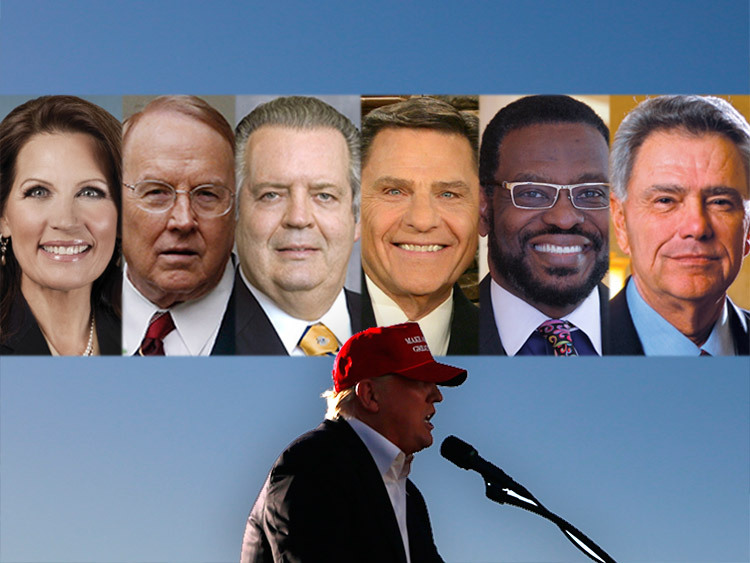 All of evangelicalism’s leading intellects are distinctly absent. The presidents of Fuller, Trinity, Gordon-Conwell, Dallas, and Asbury theological seminaries aren’t there, nor are the current presidents or executive directors of any evangelical denomination. Pastors Bill Hybels and Rick Warren are not there. Jack Hayford is not there. No Vineyard pastor is there. There is no representative from the governing board of the National Association of Evangelicals. To repeat: The alliance representing some 40 evangelical denominations and a slew of churches and individual members is not at the table. Richard Land: Southern Evangelical Seminary’s current president and the former head of the Southern Baptist Ethics and Religious Liberty Commission. He wrote this in Charisma News on March 3: “… it must be said, before it is too late, that whatever the problems may be, Donald Trump is not the answer. I fear that the millions of Americans who are putting their trust in Mr. Trump will be bitterly disillusioned if he were to obtain the nation’s highest office.” Land lost a lot of his evangelical mojo in 2012, when he said the Obama administration used the Trayvon Martin case to “gin up the black vote.” An investigation later found he often lifted his commentaries from others without attribution, hedging the ethics title in his commission. He stepped down. Why the shift, Dr. Land? How has Trump changed? Dobson has always found the flame alluring. Michele Bachmann: The former congresswoman and presidential candidate may be a sincere evangelical, but she is not an evangelical leader. There’s a difference. I don’t question his sincerity, but I would ask: Did you not anticipate how this would be seen? Or did the flame feel so warm and comfortable? Paula White: Another Health and Wealth advocate and the senior pastor of New Destiny Christian Center in Apopka, Florida. She co-founded Without Walls International, a Tampa megachurch that grew to 25,000, with her former husband, Randy. The couple separated in 2007. She admitted to an “inappropriate” relationship with faith healer Benny Hinn after her divorce – although she claimed they did not have an affair. I understand the lure of the flame. I’ve touched it in my political involvement. Dropping in on senators and congressmen and rubbing shoulders with BCVIPSINW (Big Christian VIPS in Washington) gets heady very quickly. But then you peer into the lives of some BCVIPSINW and you find towering egos and spent marriages. The late David Kuo wrote all about it in his book, Tempting Faith. He talked about his own moral failures – including his divorce and fathering an out-of-wedlock child – while decrying Clinton’s immorality. Later, in the Bush years, he found that Republicans don’t take evangelicals that seriously. Many evangelicals got burned in the unholy Religious Right. Fortunately, the vast majority refuse to be moths this time.